As pumpkin lovers, this time of year is amazing! 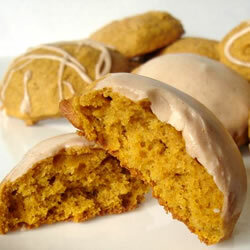 Make a bunch of pumpkin recipes on a cold Saturday, that’s what! 1 “egg” of choice- I used 1 tsp ener-g powder, but 1 tbsp ground flax would work. If necessary, you can omit completely. Preheat oven to 350 F. Combine dry ingredients, then add in wet. Spread into an oiled 7×5 pan (or double the recipe for an 8×8) and cook for 14-15 minutes. Note: You can sub agave for the sugar; they’ll just be fluffier/cake-ier. Preheat oven to 350 degrees. Line 12 cup muffin tin with silicone liners, foil liners sprayed with cooking spray or just spray the cups with cooking spray. Either of these three methods will make it easy to take the cupcake out after it’s cooked. Paper liners make it difficult to remove the cupcakes.Mix the pumpkin, sugar, brown sugar, eggs, vanilla extract and milk. Add the flour, pumpkin spice, salt, baking powder and baking soda to the mixture. Fill each muffin cup with 1/3 cup of the mixture. Bake for twenty minutes and let cool for twenty minutes. Remove cupcakes from pan and chill in the fridge for 30 minutes. 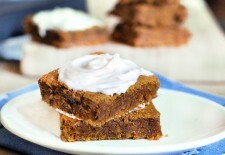 Top with whipped cream and sprinkle more pumpkin pie spice on top and serve. Makes 12 cupcakes. What’s the best pumpkin recipe? 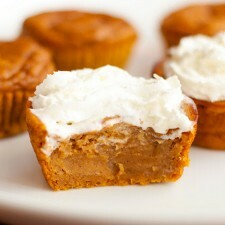 For our tastes, the Pumpkin Pie cupcakes took the prize. They were moist and like mini-pumpkin pies, and we will definitely make them again. The pumpkin bars and cookies were also delicious… but there’s only so much time for pumpkin goodies.